There are several things to note in the above code snippet. There is a class SharingService which acts like the data-sharing service. 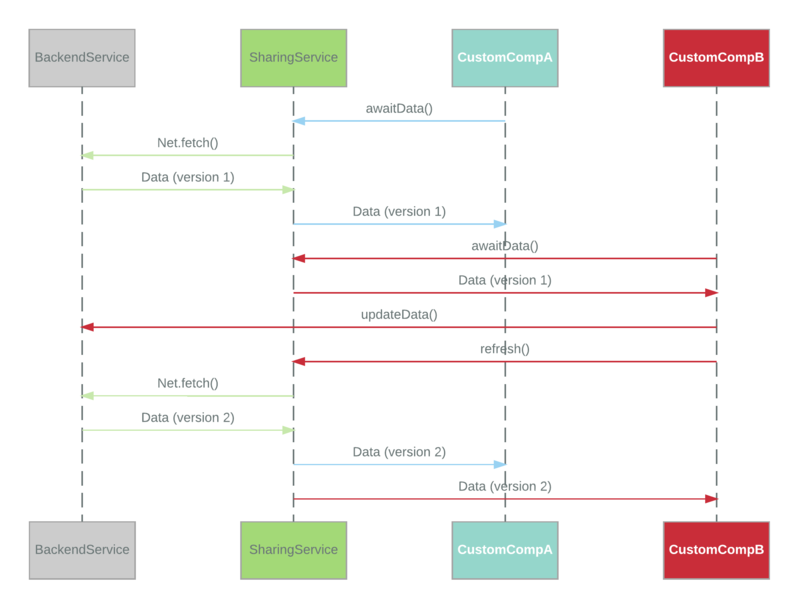 The SharingService class is injected into a component CustomComp using Angular 2’s dependency injection framework. The data is obtained from the SharingService by the CustomComp during its initialization (ngOnInit). While this implementation is straightforward, it’s not perfect. When data1 is fetched by a component (say component A) once, it remains the same throughout the lifetime of the component. When the sharing service fetches the data again for another component (say component B), this new data is not available for component A, unless component A polls for it or if component A is restarted. Communication between components A and B to know if the data needs to be loaded again can be painful, complicated, and difficult to scale. While a Promise represents a value to be resolved in future, an Observable represents a stream of values throughout. An Observable may be completed, which means it won’t emit any further values. An Observer subscribes to these Observables. These Observers are essentially callbacks to emissions of the Observable. This paradigm supports asynchronous operations naturally. In our application, the Angular 2 components have functions which act as Observers, while the data-sharing service can act as an Observable. This sharing service has a Subject. We only need the Observable portion of the subject for our components: The asObservable method is used to get the data. We also have another method called refresh. This method uses the Net module to fetch the data from the back-end service and pipes it into the Subject using the next call, to which it reacts by emitting the same value. The data reaches the component when refresh is called on the sharing service and when the component subscribes using the method getData1. However, this solution still isn’t quite right. A normal Subject will emit only future events to an Observer after subscription. For example, if component B subscribes to the data after it is refreshed once, it might not get any data at all unless it’s refreshed again or it subscribed before data was fetched by the Net module. But there is an easier solution to this problem. BehaviorSubject solves our last problem; it is a type of Subject which always emits the last emitted value to any new subscriber. Unfortunately, BehaviorSubject needs an initial value. Since our data source is a back-end service, there is no synchronous value to initialize with. Hence, we live with using an undefined as the initial state. The key benefit in this approach is that when component B initiates a refresh, component A will automatically receive the new data. Component A doesn’t need any kind of messaging system to be informed about new data. The data in component A is ever-changing throughout its lifetime. Both are not related and give such affirmation can lead to confusion for reader that are not already familiar with observables. Thanks for pointing it out! I fixed it! Thanks for the suggestion. I rephrased it to be better. We found that you can have a “cold” BehaviorSubject if you create a ReplaySubject with a buffer of 1. Then it doesn’t require an initial value. That might actually solve the initial-state issue. Thanks a lot Brian! To use Subjects and BehaviorSubject which angular module i need to import ? Great article Sriraam. I’m struggling to make this work within a polling scenario where current data is immediately available to subscribers but will be refreshed every 30 seconds. Any pointers? Where can I get the NET module? Is it a requirement or how can I replace it? It’s a very nice piece of code, very well explained. Thank you for share your knowledge. val polling = new Polling(); // or use Angular's Dependency injection to get an instance. In your setup, what is the `this.data1.error(err);` suppose to do? I have a similar setup, but have had to refactor quite a bit as calling BehaviorSubject.error() cancels all subscriptions to that subject. So no further communication is possible between that subject and any views that may be subscribed. I was attempting a retry of the Http connection, and then calling BehaviorSubject.next(result) – which was how I spotted the issue. Wondering what your process is for handling this? `this.data1.error(err)` was meant to do exactly what you described. But in my application, I assume that any response other than a 200/404 is terrible(even once) and I close the subscription, indirectly communicating with the views. This works for my application. The process to handle this should be based on what your application needs. 1) If your views don’t care about retries, you can choose to retry with back-off for n-times. However, if you failed after n-times, it means the user has probably gone offline or if the server is facing issues. If your application can afford a refresh for any of these scenarios, I say, we do `this.data1.error(err)` and severe all subscriptions. 2) If your views care about retry or if your application cannot afford a refresh, the best thing would be to use a complex messaging format for communication between the data-service and the subscribed views. `this.data1.error(err)` option may not work for you here. 1. In case the data (examples: team, user) is switched, is it necessary to unsubscribe and subscribe again ? 2. When do you call await function ? I am not sure I understand, but the type of data is determined at the time we create the BehaviorSubject. When you subscribe to this behaviorSubject, the data received would be of this type. You can only publish data of that type to that BehaviorSubject. So, switching data cannot happen dynamically, unless you use Generics. thanks for the article – I do have a question for a problem that I came across. What if component A and B are running at the same time but need to show different values for `data` (for example I might want to be showing a “developer” record (from the user table) and a “manager” record in a master-detail view ?